Breast cancer accounts for about 33% of all female malignancies and 10% of all cancers. Each year, more than a million women with breast cancer are diagnosed. Breast cancer is the first cause of death of malignancies in women of 40–44 years. Its incidence and fatality differ among races and geographical areas. In our country, Iran, about 70,000 of new cases and about 30,000 of related deaths occur. FNA cytology in the liquid-based media, which was fast becoming a useful method in gynaecology and non-gynaecology preparations, was actually first tried on Pap smear More Detailss and soon received the Food and Drug Association (FDA) approval in 1996. After this achievement, this technique began to be used widely on non-gynaecology specimens as well. In LBC preparations, the cells are adequately preserved and evenly distributed and the obscuring elements are minimal. This method provides monolayer smears and yields a much more clear background. It is less time consuming to screen and interpret, as the cells are limited in a smaller area in the middle of the slide. The other most important advantage of LBC preparations is the residual sample availability for additional ancillary techniques, such as immunocytochemistry (ICC), flow cytometry and molecular biology. However, our experience in interpretation of cell changes in liquid-based preparation compared to conventional method is limited, so the aim of our study was to assess the diagnostic efficacy of LBC and compare it with the conventional preparation in breast FNA samples. This was a prospective study. The samples were collected from 101 patients with benign and malignant breast mass between November 2015 and February 2017. FNA was performed using a 20-guage needle in multi-directions and the aspirated materials were divided into two parts. One of the parts was poured into the ThinPrep non-gynaecologic liquid medium for LBC using ThinPrep (Cytyc Corporation, Boxborough MA) and two slides were prepared. The other part was directly spread on four clean glass slides. Two slides were put in the Carnoy's solution (chloroform, 95% propanol and acetic acid) for fixation and stained by the Papanicolaou. The two others were air-dried and stained by the Wright method. The representative conventional and LBC preparations were compared by a semi-quantitative scoring system using several criteria including adequacy (presence of epithelial cluster or myoepithelial cells), overall cellularity, presence of single epithelial cells (SECs), presence of myoepithelial cells, epithelial architecture, nuclear detail, nuclear atypia and inflammatory/proteinaceous background (IB/IP) and final diagnosis. Cytological diagnosis was correlated with histopathology. The statistical data were analysed using the SPSS version 21 (IBM Inc, USA). Kappa correlation and Wilcoxon signed-rank test were used for comparison of LBC and conventional method. The ethics committee approved the study. A total of 101 cases of breast lesions were studied; among them there were 85 malignant [81 invasive ductal carcinoma (IDC) and 4 invasive lobular carcinoma] and 16 benign ones (1 granulomatous mastitis, 2 breast abscesses, 2 phylloides tumours and 11 fibroadenomas). Our study showed that LBC preparations and conventional method were concordant in all cytologic criteria, except in the background and number of SECs. LBC showed significantly less blood and debris in background (P = 0.001), and SECs were significantly more numerous in conventional method (P = 0.001). However, no statistical difference was found between LBC and conventional cytology (CS) with regards to adequacy (P = 0.655), cellularity (P = 0.132), epithelial architecture (P = 0.153), presence of myoepithelial cells (P = 0.617) and nuclear detail (P = 0.442) [Table 1]A. Wilcoxon signed-rank test was used for comparison between cytological features in LBC and CS, separately for each item [Table 1]B.
Cytological diagnoses were divided into four groups: benign/atypical favouring benign (AFB) and malignant/atypical favouring malignant (AFM). [Table 2] and compared each group with final histological diagnosis. The two methods showed a good correlation (Kappa correlation: 83%). Our study showed that the sensitivity of LBC for diagnosis of breast lesion was 98.8% with a specificity of 94%, positive predictive value (PPV) of 99% and negative predictive value (NPV) of 94%; also, the sensitivity of CS for diagnosis of breast lesions was 94% with a specificity of 94%, PPV of 98% and NPV of 75%. We observed six discordant cases. One case was cytodiagnosed as suspicious for malignancy in the two method preparation, but the final histological diagnosis showed a borderline phylloides tumour. Small cluster with mild atypical cellular changes was the cause of this discrepancy. In one case, both preparations reported a benign lesion, but the final diagnosis was IDC. The smears showed moderate cellularity with small loose admixed with tight clusters and minimal atypia. Some myoepithelial cells were observed. The histological slides showed a Grade I/III IDC admixed with benign glandular proliferation. The other four malignant cases were reported as malignant or suspicious to malignancy in LBC, but all of them were diagnosed as benign in the conventional method. The most important factor resulting in this event was the presence of small tight clusters without atypia in the conventional preparation. The discordant cases are summarised in [Table 3]. LBC preparations was favoured over the CSs in evaluation of gynaecological samples and soon got the FDA approval in 1996. According to this achievement, the LBC method was widely used in non-gynaecological specimens. Conventional smears are usually mixed with cell debris, exudates and bloody material which make the interpretation difficult, leading to a high proportion of inadequate or unsatisfactory cases for diagnosis. To solve the mentioned problem, LBC technique was introduced with special preservers, removing debris, blood, inflammation and proteinaceous material; the cells are distributed in monolayer, usually without obscuring agents and drying artefacts. In our study, we analysed the breast lesion FNAs processed by ThinPrep technology to those prepared by conventional smears and compared some cytological features between the two methods. In the current study, the cellularity of LBC and CS was described as scanty, adequate and abundant. The cellularity of the cytologic slides on two conventional and LBC was the same (P = 0.132). This was in the same line with the result of previous studies. It should be mentioned that the cellularity of cytology slides is mostly dependent on the expertise of the performer and number of FNA passes. The percentage of clusters was higher in LBC preparation compared to the conventional method in our study. This finding was similar to those of Leung et al. and Komatsu et al. 's studies We described epithelial architecture as tight clusters, loose cluster and SECs. We observed equal tight cluster (17), equal loose cluster (75) and equal tight and loose ones (5) in both methods. According to the cluster size, smaller clusters were seen in LB. This was misleading in benign lesions, especially fibroadenoma in which generally large and tight staghorn clusters were observed [Figure 1]. Michael and Hunter study showed that cellular aggregates were usually fragmented and smaller in LBC; also, the study conducted by Ryu et al. revealed that three-dimensional clusters seemed to be more pronounced in both benign and malignant lesions. Gerhard and Schmitt stated that the presence of three-dimensional clusters, loss of cohesion and also presence of small clusters may lead to misdiagnosis of malignancy. Also, we observed a lower number of SECs in LBC. SECs were divided into four groups: zero, scanty, moderate and abundant. In the abundant group, 42 cases were in the conventional smears and 6 cases in the LBC with a significant P value. We described cell changes in the two forms of nuclear detail and nuclear atypia, both of which had a good correlation with the cytologic diagnosis and histologic one. An excellent nuclear detail was seen in 27% of cases in LBC and 23% of them in CS; also, in malignant cases marked nuclear atypia was seen in 21% of cases in LBC and 19% of CS. Some studies show that cellular morphology alters in LBC in the form of being rounded and smaller than flattened in CS. [12–16] Other studies show poor cellular preservation and decreased nuclear detail, but the majority of the studies revealed better cellular preservation with better nuclear detail, and more pronounced nucleoli (in both benign and malignant lesions) in LBC smears. In the study carried out by Feoli et al., nuclear changes were much more subtle in tubular carcinomas, papillary carcinomas and low grade IDCs, leading to a high rate of false negative diagnosis before LBC training. Another cellular change we noticed was about myoepithelial cells which mainly had preserved cytoplasms. 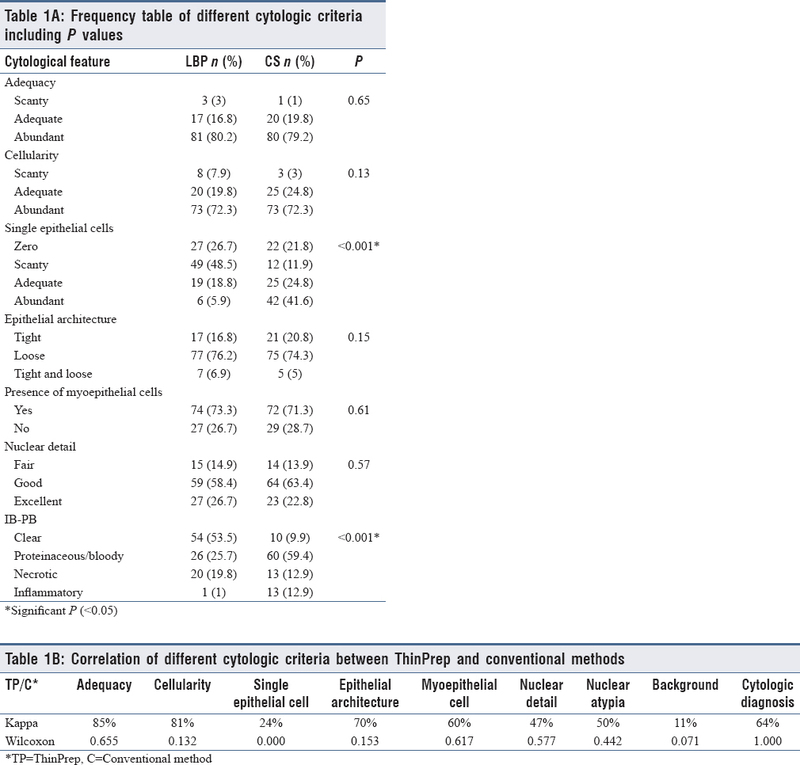 Michael and Hunter stated that myoepithelial cells (bipolar cells) were usually decreased in number and less apparent in LBC smears and may have intact cytoplasms resembling fibroblasts or epithelial cells, as stated in the study of Feoli et al. We also observed a cleaner background in LBC preparation compared to the conventional ones [Figure 2]. This event has its own pros and cons. Elimination of obscuring background will make the slide screening simpler and faster; on the other hand, it also eliminates the informative background of some breast pathologies. For example, in our case of mucinous carcinoma the background was clear in LBC, so exact subtyping was not possible based on LBC. Also, necrotic background which can be used as a cytologic clue of malignancy was less prominent in LBC. In our study, the background elements were described as clear, bloody, necrotic and inflammatory. LBC smears had more clear background than CSs (54 cases/10 cases). The bloody background was seen more in CSs than LBC (60 cases/26 cases). The inflammatory background was seen more in CS than LBC (13 cases/1 case). None of our LBC cases revealed calcification in background while it was present in CS. One of our malignant cases was matrix-producing IDC in which the matrix background was absent in LBC but present in CS. Many studies have shown that clean background is much more pronounced in LBC smears as a result of elimination of obscuring elements (blood, inflammation and cell debris),,,, but some studies stated that it was difficult to determine whether the present inflammatory cells in LBC are the preserved ones (true inflammatory process) or are secondary to the lysed blood., On the other hand, we should consider this fact that an informative background may also be eliminated due to preparation media which include a decrease or loss of extracellular material and stromal fragmentation. Adipocytes destruction may result in difficult diagnosis of lipoma cases and fat necrosis ones. In summary, the cytological changes of LBC including cleaner background, less SEC, smaller cluster, decreased cell size and preservation of the myoepithelial cell cytoplasm were compared to the conventional method. Cytological findings of breast fibroepithelial lesions which mainly consist of fibroadenoma and phylloides tumour were large and staghorn tight cluster admixed with bipolar naked nuclei and stromal fragments. In LBC, the clusters were smaller and myoepithelial cells were less prominent. One of our discordant cases belonged to this category. Small cluster with mild atypical cellular changes was the cause of this discrepancy. The case was cytodiagnosed as suspicious for malignancy in the two method preparation, but the final histological diagnosis showed a borderline phylloides tumour. This finding was in consistent with previous studies. They stated that the false positive rate of diagnosis of fibroadenoma as atypical or suspicious was higher in LBC compared to the CS. However, nuclear atypia has been reported in cytology slides prepared by the conventional method as well. In addition to cluster morphology change and the decrease in the number of myoepithelial cells, some studies demonstrated adhesion of cell cluster and prominent nucleoli, which pose a cytologic pitfall for diagnosis of fibroadenoma. Breast cancer can be reliably diagnosed on LBC preparation. As in CS, the presence of loose clusters with a different degree of nuclear atypia, presence of atypical isolated cells and mitotic figures are the criteria of malignancy. As previously mentioned, clearing of the background while eliminating blood, necrotic cell debris and inflammatory cells contributes to faster and simpler diagnosis, but some types of carcinoma including carcinoma with medullary features and mucinous carcinoma have lost their informative background [Figure 3]. Some low-grade ductal carcinoma and lobular carcinoma may also result in false negative diagnosis because the cells are smaller with milder nuclear atypia in LBC, but careful screening of the slides shows cytological changes in favour of malignancy including Indian-file like arrangement of cells, isolated atypical cells and nuclear pleomorphism. Five discordant cases belonged to this category. In one case, both preparations reported a benign lesion, but the final diagnosis was IDC. The other four cases were reported as malignant or suspicious to malignancy in LBC, but all of them were diagnosed as benign in the conventional method. The most important factor resulting in this event was presence of small tight clusters without atypia in the conventional preparation. Our study showed that the sensitivity LBC for diagnosis of breast lesion was 98% with a specificity of 94%, 99% PPV and 94% NPV, compared to 94% sensitivity, 94% specificity, 98.7% PPV and 0.75% NPV in the conventional method. Diagnostic performance of these two tests is excellent with the Kappa correlation of 0.83. In the study of Kontzoglou et al., the LBC technique presented a sensitivity of 97.7%, specificity of 98%, PPV of 96.9%, NPV of 98.5% and an overall accuracy of 97.9%. In the study conducted by Ryu et al., the LBC diagnostic accuracy was 90.5%. Also, in the study of Zhu et al., the sensitivity for detecting a high-grade lesion was somewhat better with the ThinPrep sample (66%) compared to the conventional Pap smear (47%). In Gramlich and Easley study, the ThinPrep technique had a sensitivity of 100% and specificity of 74% for the detection of breast carcinoma, while the sensitivity and specificity of CS were 100% and 93%, respectively. In Mahinderu et al. 's study, sensitivity and specificity for both LBC and CS were 95.2% and 100%, respectively. PPV and NPV for manual LBC and CS were 100% and 96.9%, respectively. LBC had some advantages compared to the conventional method. This procedure decreases some pitfalls including drying the artefact and improper spreading of the specimen, which are directly related to the experience of the person who performs the FNA and makes the cytologic slides. Finally, we concluded that LBC of breast specimens is an accurate diagnostic tool with a high diagnostic yield in benign and malignant lesions. However, for proper interpretation, the cytopathologist should be familiar with cytological differences between LBC and CS. Ban KA, Godellas CV. Epidemiology of breast cancer. Surg Oncol Clin N Am 2014;23:409-22. Heiydari S, Salahshorian A, Rafie F, Hoseini F. Correlation of perceived social support and size of social network with quality of life dimension in cancer patients. Feyz 2008;12;15-22. 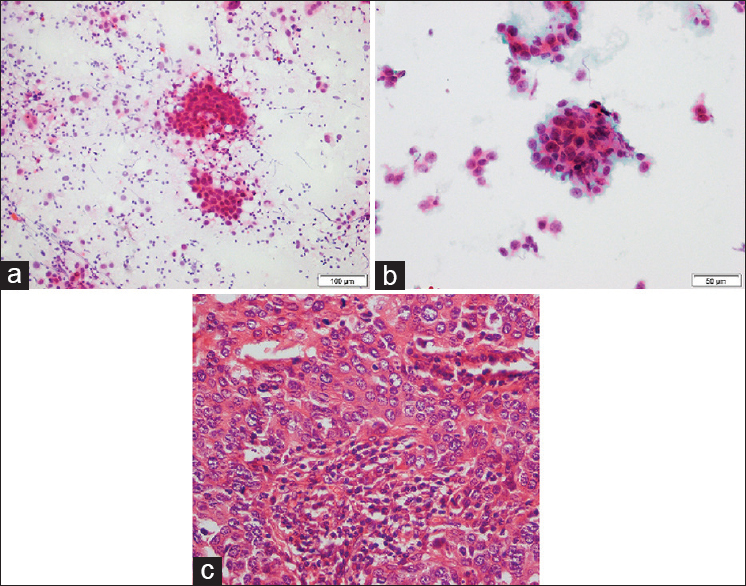 Berner A, Sauer T. Fine-needle aspiration cytology of the breast. Ultrastruct Pathol 2011;35:162-7. Ariga R, Bloom K, Reddy VB, Kluskens L, Francescatti D, Dowlat K, et al. Fine-needle aspiration of clinically suspicious palpable breast masses with histopathologic correlation. Am J Surg 2002;184:410-3. Ajkay N, Bloomquist EV, Martin RC, Frazier TG, Barrio AV. Fine-needle aspiration cytology in the evaluation of patients with radiographically occult, palpable breast abnormalities. Surgery 2015;158:946-53. Frable WJ. Fine-needle aspiration biopsy: A review. Hum Pathol 1983;14:9-28. Gerhard R, Schmitt F. Liquid-based cytology in fine-needle aspiration of breast lesions: A review. Acta Cytol 2014;58:533-42. 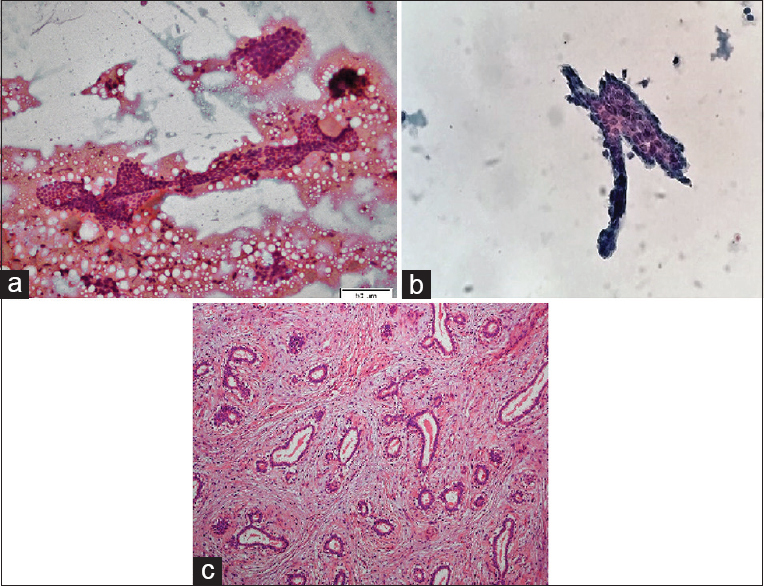 Mahinderu K, Nandini N, Singh AK, Kishore A. manual liquid based cytology in breast fine needle aspiration–comparison with the conventional smear. IOSR J Dent Med Sci 2016;1:17-24. Singh P, Rohilla M, Dey P. Comparison of liquid-based preparation and conventional smear of fine-needle aspiration cytology of lymph node. J Cytol 2016;33:187-191. Ryu HS, Park IA, Park SY, Jung YY, Park SH, Shin H-C. A pilot study evaluating liquid-based fine needle aspiration cytology of breast lesions: A cytomorphological comparison of SurePath® liquid-based preparations and conventional smears. Acta Cytol 2013;57:391-9. Michael CW, Hunter B. Interpretation of fine-needle aspirates processed by the ThinPrep® technique: Cytologic artifacts and diagnostic pitfalls. Diagn Cytopathol 2000;23:6-13. Feoli F, Ameye L, Van Eeckhout P, Paesmans M, Marra V, Arisio R. Liquid-based cytology of the breast: Pitfalls unrecognized before specific liquid-based cytology training-proposal for a modification of the diagnostic criteria. Acta Cytol 2013;57:369-76. Leung CS, Chiu B, Bell V. Comparison of ThinPrep and conventional preparations: nongynecologic cytology evaluation. Diagn Cytopathol 1997;16:368-71. Komatsu K, Nakanishi Y, Seki T, Yoshino A, Fuchinoue F, Amano S, et al. Application of liquid-based preparation to fine needle aspiration cytology in breast cancer. Acta Cytol 2008;52:591-6. Kurtycz DF, Hoerl HD. Thin-layer technology: Tempered enthusiasm. Diagn Cytopathol 2000;23:1-5. 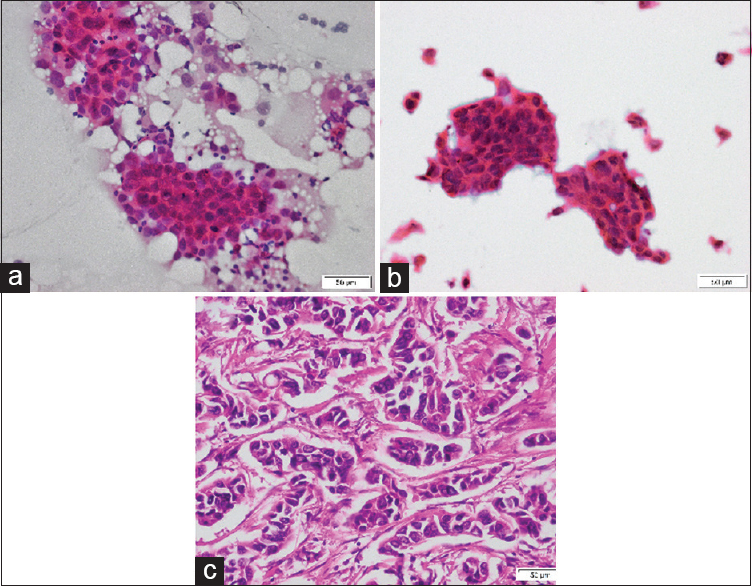 Kontzoglou K, Moulakakis KG, Konofaos P, Kyriazi M, Kyroudes A, Karakitsos P. The role of liquid-based cytology in the investigation of breast lesions using fine-needle aspiration: A cytohistopathological evaluation. J Surg Oncol 2005;89:75-8. Zhu J, Norman I, Elfgren K, Gaberi V, Hagmar B, Hjerpe A, et al. A comparison of liquid-based cytology and Pap smear as a screening method for cervical cancer. Oncol Rep 2007;18:157-60. Gramlich TL, Easley KA. ThinPrep vs. conventional smear cytologic preparations in analyzing fine-needle aspiration specimens from palpable breast masses. Diagn Cytopathol 1999;21:137.